Following a tip from an Argentinean Jew, the Mossad, in cooperation with the Israel Security Agency, located in Argentina and abducted Adolf Eichmann the Nazi War Criminal, responsible for the implementation of Hitler´s "Final Solution", to eradicate the European Jewish community during World War II. By sedating him, using a fake passport and dressing him as part of an El Al flight crew, the team was able to smuggle him to Israel in May 1960 to stand trial the following year. 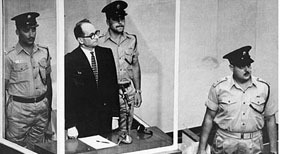 More than 100 Holocaust survivors testified at the trial, in which he was found guilty; he was hung the following year. 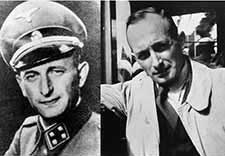 Eichmann had been the world´s most wanted man for his part in the murder of 6 million Jews by the Nazis.